The Group’s underlying performance for the year ended 31st December 2018 was strong, with both revenue and profit being slightly ahead of the Group’s upgraded trading update on 27th November 2018. Revenue rose by 5% to £326.8 million for the year (2017: £311.2 million). Group underlying operating profit increased by £1.5 million to £8.8 million. All businesses were profitable with the Central and South West region recording an operating profit of £1.8 million compared to a loss in 2017 £1.8 million. London and South East remains the core of the business delivering an underlying profit of £7.2 million; a 3.7% margin. Scotland’s revenue was £21.2 million (2017: £23.0 million), and underlying operating profit was £0.8 million (2017: £0.8 million), representing an underlying operating margin of 3.8% (2017: 3.5%). Scotland’s continued strong performance was due in part to its collaboration on Intelligent Buildings with the London Operation. As well as its continuing strength in the residential market, Scotland has generated significant IT, mechanical and electrical workstreams in the commercial sector. Net finance costs were £0.8 million (2017: £0.8 million), including a £0.6 million (2017: £0.6 million) non-cash financecharge in respect of the Group’s defined benefit pension scheme. Net interest on bank facilities remained at £0.2 million (2017: £0.2 million), reflecting good cash performance throughout the year. The final dividend will be paid, subject to shareholder approval, on 24th May 2019 to those shareholders on the register at 26th April 2019. The shares will go ex-dividend on 25th April 2019. A dividend reinvestment plan (‘DRIP’) is available to shareholders. In accordance with IAS 19 ‘Employee benefits’, an actuarial income of £0.6 million, net of tax, has been recognised in reserves, with the pension scheme deficit falling by £0.4 million to £23.0 million (2017: £23.4 million). This liability includes a £0.2 million charge that has been expensed through the consolidated income statement being the estimate for the impact of GMP equalisation for the above scheme. Net cash balances improved to £12.4 million at 31st December 2018 (2017: £11.7 million) after deducting the £nil (2017: £3.0 million) outstanding under the Group’s revolving credit facility. The Group has a £15.0 million revolving credit facility, which is committed until 31st August 2022, and a £5.0 million overdraft facility, renewable annually. Interest on overdrawn balances is charged at 2.0% above base rate, and interest on balances drawn down under the revolving credit facility is charged at 1.7% above LIBOR, fixed for the duration of each drawdown (typically three to six months). The Group was compliant with the terms of the facilities throughout theyear ended 31st December 2018 and the Board’s detailed projections demonstrate that the Group will continue to meetits obligations in the future. The Board’s detailed cash flow projections include an allowance for the impact of a change in VAT regime from 1st October 2019. From this date the Government is planning to introduce a VAT domestic reverse charge for building and construction services. 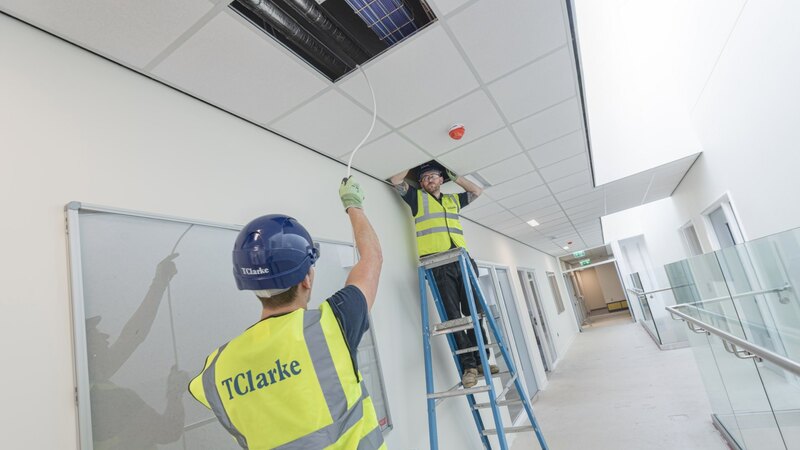 Under this scheme TClarke will continue to charge VAT to end customers but will no longer beable to charge VAT to contractors and will not pay VAT on costs incurred with subcontractors. The Board’s projectionsshow a healthy cash position after taking account of this change of regime. structure. The strong underlying performance of the Group has resulted in shareholders’ equity rising by £5.7 million during the year to £22.1 million (2017: £16.4 million). The Group’s consolidated financial statements are prepared in accordance with International Financial ReportingStandards (‘IFRSs’) as adopted by the European Union. The Group has adopted IFRS 15 ‘Revenue from contracts with customers’ and IFRS 9 ‘Financial instruments’. Under IFRS 15 revenue can only be recognised when it is ‘highly probable’and so, for example, claims cannot be recognised until agreed. A variation cannot be recognised unless it is highly probable that no significant reversal of the cumulative revenue will occur. Revenue on FM jobs is recognised when the job is complete. IFRS 15 is closely aligned to the Group’s previous revenue recognition policy and therefore adoptingIFRS 15 has had no material impact on the Financial Statements. The impact of IFRS 9 on the Group relates to the recoverability of receivables after taking account of lifetime expected credit losses. The Group has historically experienced very low levels of ‘bad debts’, with £0.2 million being charged tothe income statement in both 2018 and 2017. Therefore, the adoption of IFRS 9 has had no material impact on the Group. The Group’s main financial assets are contract and other trade receivables, cash and bank balances. These assets represent the Group’s main exposure to credit risk, which is the risk that a counterparty will fail to discharge its obligations, resulting in financial loss to the Group. The Group may also be exposed to financial and reputational risk through the failure of a subcontractor or supplier. The financial strength of counterparties is considered prior to signing contracts and reviewed as contracts progress where there are indications that a counterparty may be experiencing financial difficulty. Procedures include the use of credit agencies to check the creditworthiness of existing and new clients and the use of approved suppliers’ lists and Group-wide framework agreements with key suppliers.